Welcome to issue sixty-four of Lightspeed! 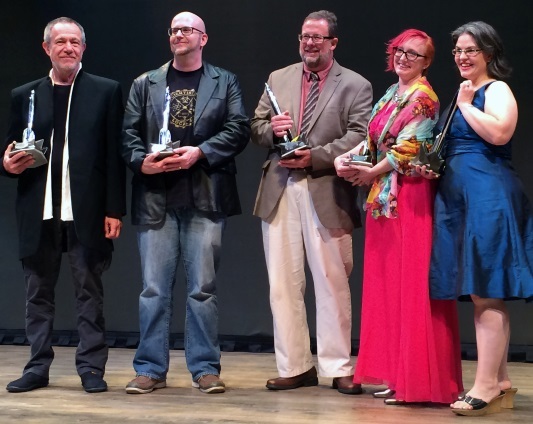 We’re just back from Sasquan, the 73rd annual World Science Fiction Convention (Worldcon), held this year August 19-23 in Spokane, Washington, and as you may have heard on the interwebz, we won another Hugo! Lightspeed took home the rocket for Best Semiprozine, but also, just as exciting there were two other Lightspeed Hugo victories: Thomas Olde Heuvelt’s story from Lightspeed, “The Day the World Turned Upside Down,” won the Hugo for Best Novelette, and one of our illustrators, Elizabeth Leggett, won the Hugo for Best Fan Artist. Congrats to them both, and thanks to everyone who voted for all of us. (Also thanks to all of the people who work with us on Lightspeed, and of course all of our authors and artists—I thanked them all on stage, but it bears repeating!) We won the Hugo for Best Semiprozine last year as well, but most of our team wasn’t able to be in London to accept the award in person (none of us except for our podcast producer, Stefan Rudnicki, were able to make it), so having all of us there in person this year made it extra special for us. From L to R: Stefan Rudnicki (Podcast Producer), John Joseph Adams (Editor/Publisher), Rich Horton (Reprint Editor), Christie Yant (Guest Editor, Women Destroy Science Fiction! ), Wendy N. Wagner (Managing/Associate Editor). Photo by Karen Smale. In other awards news, the World Fantasy Award nominations were also announced recently, and I’m pleased to report that I have been once again nominated in the “Special Award, Professional” category. I am extremely honored to be nominated again (now for the seventh time overall, including three Anthology nominations), and I will be in Saratoga Springs, New York for the World Fantasy Convention (November 5-8) when the awards are presented (where I look forward to losing to Gordon Van Gelder in person). The full list of finalists is available at worldfantasy.org/awards. And ICYMI last month: Both Lightspeed generally and our Women Destroy Science Fiction! special issue specifically have been nominated for the British Fantasy Award! (Lightspeed is nominated in the Periodicals category, while WDSF is nominated in the Anthology category.) Huge congrats to Christie Yant and the rest of the WDSF team, and thanks to everyone responsible for selecting these nominations—it’s a huge honor! The winners will be announced on October 25 at FantasyCon 2015 in Nottingham, UK. You can find the full list of finalists at britishfantasysociety.org. Releasing this month, on September 15, is a new anthology I edited called Loosed Upon the World, the definitive collection of climate fiction. These provocative stories explore our present and speculate about all of our tomorrows through terrifying struggle and hope. Join bestselling authors Margaret Atwood, Paolo Bacigalupi, Nancy Kress, Kim Stanley Robinson, Jim Shepard, and over twenty others as they presciently explore the greatest threat to our future. Visit johnjosephadams.com/loosed to learn more. And ICYMI, last month I published a new anthology co-edited with Daniel H. Wilson called Press Start to Play. It includes twenty-six works of fiction that put video games—and the people who play them—in the spotlight. Whether these authors are tackling the humble pixelated coin-op arcade games of the ’70s and ’80s, or the vivid, immersive form of entertainment that abounds today, you’ll never look at phrases like “save point,” “first-person shooter,” “dungeon crawl,” “pwned,” or “kill screen” in quite the same way again. With a foreword from Ernest Cline, bestselling author of Ready Player One, Press Start to Play includes work from: Daniel H. Wilson, Charles Yu, Hiroshi Sakurazaka, S.R. Mastrantone, Charlie Jane Anders, Holly Black, Seanan McGuire, Django Wexler, Nicole Feldringer, Chris Avellone, David Barr Kirtley, T.C. Boyle, Marc Laidlaw, Robin Wasserman, Micky Neilson, Cory Doctorow, Jessica Barber, Chris Kluwe, Marguerite K. Bennett, Rhianna Pratchett, Austin Grossman, Yoon Ha Lee, Ken Liu, Catherynne M. Valente, Andy Weir, and Hugh Howey. You can sample the anthology by reading “God Mode” by Daniel H. Wilson, one of our reprint selections in this issue. Visit johnjosephadams.com/press-start to learn more. 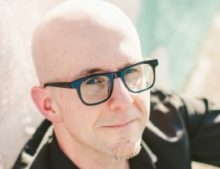 We have original science fiction by Caroline M. Yoachim (“Seven Wonders of a Once and Future World”) and Megan Arkenberg (“All in a Hot and Copper Sky”), along with SF reprints by Daniel H. Wilson (“God Mode”) and Carrie Vaughn (“Harry and Marlowe Meet the Founder of the Aetherian Revolution”). Plus, we have original fantasy by Sean McMullen (“The Ninth Seduction”) and Heather Lindsley (“Werewolf Loves Mermaid”), and reprints by Maurice Broaddus (“The Iron Hut”) and Theodora Goss (“Estella Saves the Village”). All that, and of course we also have our usual assortment of author spotlights, a feature interview with award-winning writer and translator Ken Liu, and the latest installment of our book review column. Plus, because our cover artist this month couldn’t participate in our regular artist showcase feature, we substituted a movie review column, and thus are pleased to present an insightful look at Mad Max: Fury Road from the always-delightful Carrie Vaughn. For our ebook readers, we also have the novella “Milo and Sylvie,” by Eliot Fintushel, and a pair of novel excerpts: Walk on Earth a Stranger, by Rae Carson, and The Traitor Baru Cormorant, by Seth Dickinson.